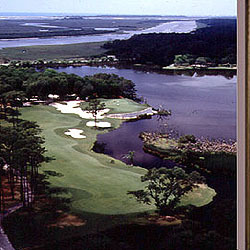 Oyster Bay, which opened in 1983, was voted the 1983 Golf Digest "Resort Course of the Year" and ranked by the same publication among the top 50 public courses in the country in 1990. Oyster Bay Golf Links, another classic creation by developer Larry Young and Architect Dan Maples, is a rare blend of the various philosophies of golf course architecture. The par-70 course plays to just under 6,700 yards with two island green par threes. Oyster Bay is one of the most beautiful and diversified courses to be found anywhere. It is located in Sunset Beach, NC just minutes north of its predecessor, Marsh Harbour.